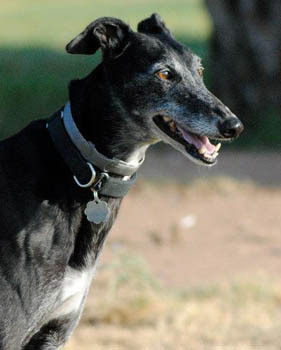 Onyx is an 8-year-old small black female born in April 2004. She arrived with Blade as an owner surrender to a shelter. 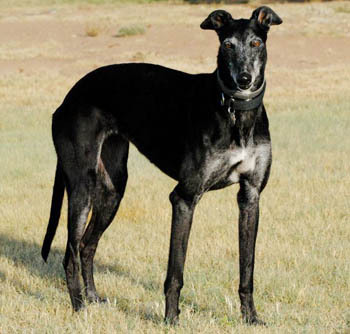 GALT eventually received 10 greyhounds from this same owner, the other eight being, Carbon, Charity, Clooney, Cupcake, Harry, Stetson, Stewart, and Timex. It is almost certain that Blade and Onyx are siblings. Unfortunately, Onyx, like the other nine, arrived heartworm positive, and with a heavy load of intestinal parasites. But this happy girl's long, 8-month journey back to health is now complete! Onyx wanted nothing to do with the cat after being hissed at. She is cat trainable.